An intersection in Mexico City. Photo by Hector Rios, EMBARQ Mexico. Remember that 1994 blue minivan that your mom used to pick you up from school in? Well, chances are that gas-guzzling, oil-burning junker is probably still chugging along south of the U.S. border, maybe hauling around a Mexican family in Chihuahua or Sonora, or even as far south as Mexico City. Hundreds of thousands of high-emissions, high-mileage, used vehicles head to border cities like Ciudad Juarez every year, and that number is set to increase, as falling trade barriers allow more cars to enter Mexico. Millions of clunkers from the U.S. have been imported into Mexico over the past twenty years, and millions more are headed south, courtesy of the North American Free Trade Agreement, which requires Mexico to open its borders to used vehicles from the United States and Canada. According to the Policy Handbook for the Regulation of Imported Second-Hand Vehicles, a recent report by EMBARQ Mexico, imported second-hand vehicles, also referred to as “auto chocolate,” are a growing challenge in Mexico, the global leader in used vehicle imports, with more than half a million used cars flooding into the country from the U.S. annually. The trend of selling cheap, non-fuel-efficient, and often unsafe vehicles to less-developed neighbors, at often-inflated prices, is a growing challenge in developing nations, especially as increasingly vehicle-dependent countries such as China and India begin an unprecedented export of used vehicles to their less developed neighbors, such as Bangladesh, Sri Lanka, and even Nigeria and the Ukraine. Mexico imports 500,000 used cars from the United States annually, down from 1.2 million in 2006, when a presidential decree went into effect demanding a time-consuming proof of origin certificate. However, combined with the 1 million domestically-produced new cars and virtually no used vehicle exports, Mexico is stuffing itself with “auto chocolate,” causing an environmental and social catastrophe. Unlike the United States, where emissions testing is the norm in most cities, Mexico has no functional testing programs outside of Mexico City and no vehicle registration fees. Old vehicles coming in from the US would often fail US emissions tests because they lack emissions-regulating parts, such as catalytic converters, and safety features, such as airbags and seat belts, leading to increased CO2 emissions and decreased passenger safety. According to the Mexican Secretary of Health, traffic collisions are the number one cause of death in the country of young people age five to 25, and is the number one cause of orphanhood in the country. 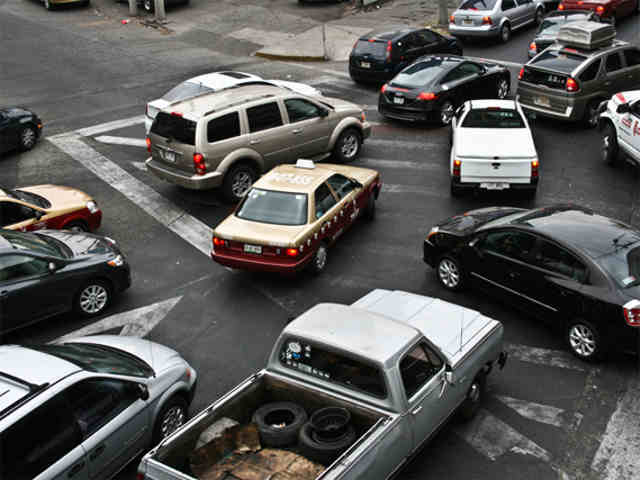 As more cars clog roads from Tijuana to Cancun, fatal and debilitating collisions are an increasing problem in Mexico (especially in areas without adequate infrastructure to accommodate vehicles and pedestrians); additionally, long-term health issues are also on the rise, such as contamination-related illnesses like asthma. Imports of used vehicles from the U.S. have grown because used American vehicles are still cheaper than second-hand vehicles from Mexico. Macias says eliminating imports would foster a closed-cycle of domestic auto consumption, making the used car market more competitive. Mexican-made new cars with stricter emissions standards would eventually become cleaner, cheaper, domestic second-hand vehicles — and although there will still be new cars added to the Mexican fleet, a closed system will slow the increase of high-emissions used cars to the fleet. According to the Road Safety Fund, nearly 1.3 million people are killed on the world’s roads each year, while 50 million people are injured or disabled. Ninety percent of road casualties occur in developing countries. Besides, the increase in road accidents and contamination and the process of moving from non-motorized transport to motorized transport encourages governments to increase public expenditure on roads, deviating much-needed funds for other infrastructure improvements and social improvements, such as education and health. On a global scale, the remedy to reduce road deaths includes focusing on affordable, safe and efficient public transport; road safety education; and smart development of cities, centered on pedestrians and non-motorized transport, not just roads and cars. Nearly 1.3 million people are killed on the world’s roads each year. Up to 50 million people are injured, and many remain disabled for life. 90% of casualties from road deaths occur in developing countries. Annual road traffic deaths are forecast to rise to 1.9 million people by 2020. Road traffic injuries are the number one cause of death for young people worldwide. By 2015 road traffic injuries will be the leading health burden for children over the age of five years in developing countries. The economic cost to developing countries is at least $100 billion a year. Road traffic injuries place an immense burden on hospitals and health systems generally. A global Action Plan includes practical measures which, if implemented, could save millions of lives. For more information on global and U.S.-Mexican used vehicle trade, contact Yasmin Khan at EMBARQ Mexico, ykhan@embarqmexico.org, 52 55 3096-5742, ext. 203.